Last night as we set Jolly (our Elf on the Shelf) in his new spot for the little ones to find him in the morning we realized that this was the last night, seeing as today is Christmas Eve. So we set the kids up with a letter. When they finds Jolly in the morning the older ones will read them the letter and then I will let them say their goodbyes. So what was the last couple of days like with our Elf on the Shelf? I realized when I was uploading our photos that I missed taking one of our mischievous little imp hanging out of my sewing box clutching a poppy but, the monkeys will be up soon and getting caught on Christmas Eve wouldn’t sit so well with any of them. I have to admit, I am a little sad to see the little guy go which is funny now because if you recall we weren’t going to get an elf on the shelf and then we did! 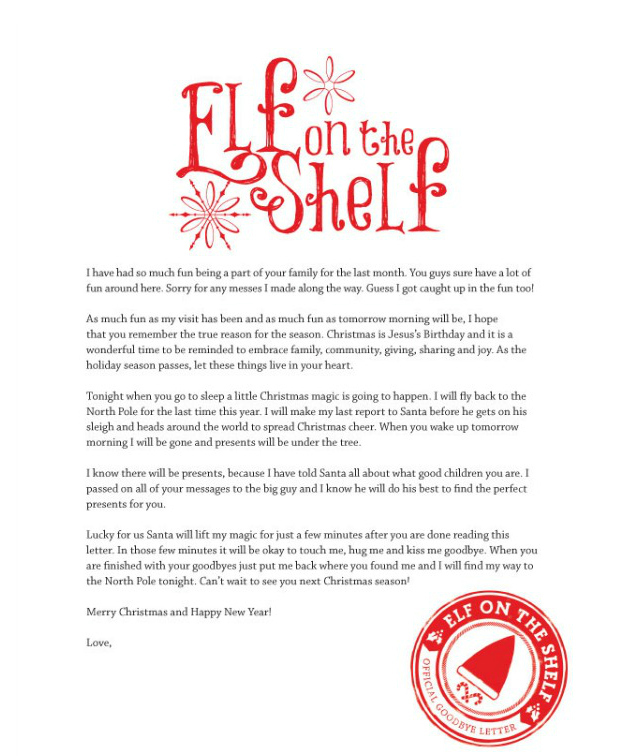 For more ideas check out Elf ideas week 1 & Elf Ideas week 2 and don’t forget the Printable Goodbye letter. Don’t forget to check our facebook page later to see those cute little goodbyes! Love the post!!! I was wondering how we could clue up with our Elf and was thinking of having her write a letter. 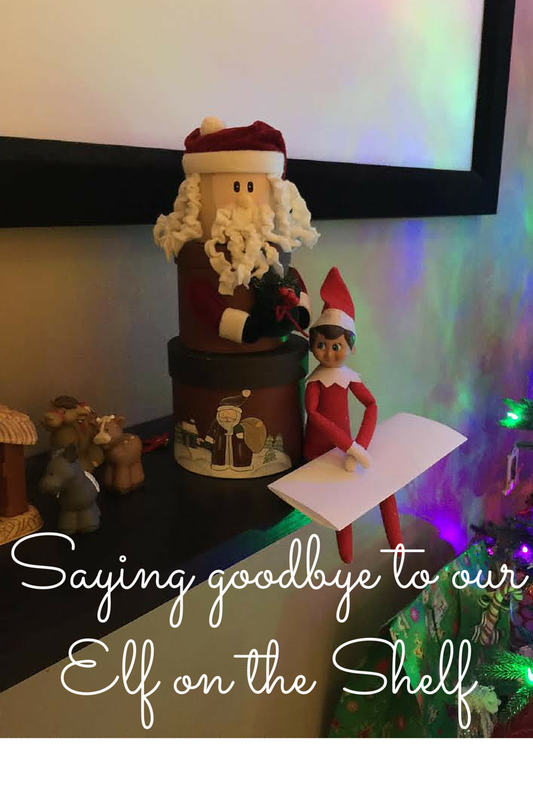 Today was our first day with our Elf, she arrived just last night!!! We did Elf for the first time this year and my little guy barely noticed! Next year I will do more with him and have a proper sendoff! It was our first year too and I am sort of sad that the guys are gone as well. Aww. Sad to say goodbye until next year, but it looks like you guys had tons of fun with him! Looks like you had a great time with the elf this year! Our kids were sad to see ours go home. I have been thinking how to send him away. great idea. making it a special occasion to go away will make it more memorable when he comes back. Me too! His last night here Abigail put a small bowl of sugar and cinnamon beside him just to ensure he would make it back to the North Pole safely. I see Jolly got into your snack tin – naughty elf! I love the goodbye letter – what a great idea! I bet you’re happy to see him go! hehe Such a great idea for an elf farewell! The first year, I loved our Elf on the Shelf. But with three kids I got this crazy idea that we needed 3 elves. Now I’ve come to look forward to the day they leave. To make things even crazier, my mom bought them the pet reindeer to add to the mix. My grand daughter loves her Elf on the Shelf and is always sad when he disappears until next year. I’ll have to tell my daughter about your post and leaving a letter next year. I love how the elf toilet papered your tree! My kids were so sad to see our elf go this year. She’s so much fun! I know the kids must have gotten such a kick out of seeing what mischief he made each night. It’s a really cute idea to have this each year. Aw bye Elf hope you have a safe trip and see you next year. I love the idea of a goodbye letter. 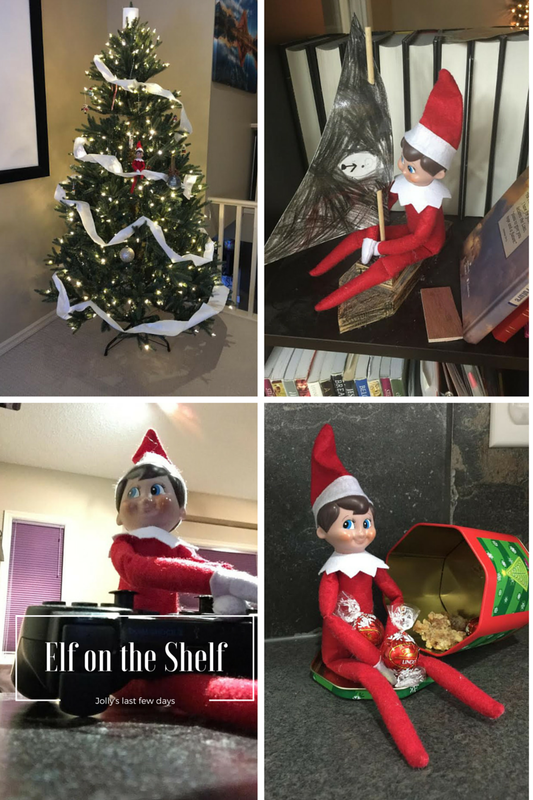 It looks like your Elf on a Shelf has had lots of fun this season! Ours has been a bit naughty! I just love little Elf on the Shelf! I’ve enjoyed seeing all the ideas that ppl come up with! It’s crazy how fast this year has come and almost gone? Great post :0) Loved your name too!